The photographer was in a dark Alpine forest near Tyrol, about 19 miles (30 kilometers) south of Innsbruck. Multiple exposures are made to collect enough light for an image that would otherwise not be evident to the eye. Over snow-covered peaks in Western Austria, skywatcher Babak Tafreshi captured the head of the constellation Scorpius in this recent view. Scorpius, the Scorpion, is a constellation easily seen from the Southern Hemisphere during summer months. The avid skywatcher can make out the body of the scorpion, the curved tail and a bright row of stars that make up the stinger. Greek mythology associated with this constellation says the god Zeus lifted the Scorpion into the sky after the creature defeated Orion, the Hunter, in battle. Orion was also placed in the sky as a constellation but was put opposite to his nemesis so the two would never meet again. The positions of these two constellations are indeed opposite as Orion dips below the western horizon just when Scorpius emerges in the south. To get this photo Tafreshi, who is based in Germany, didn't have to travel far. "Austria is one of the few European countries where it’s still possible to see truly dark skies, thanks to high mountains and low population," he wrote on his website TWAN ( The World At Night). The photographer was in a dark Alpine forest near Tyrol, about 19 miles (30 kilometers) south of Innsbruck. Multiple exposures are made to collect enough light for an image that would otherwise not be evident to the eye. 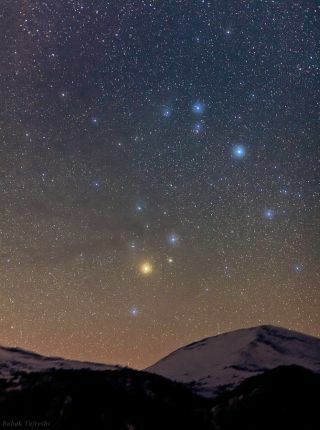 In this stunning image, The orange-red star Antares (Alpha Scorpii) is the brightest in the picture. Antares is classified a supergiant star because its radius is 700 times that of the sun and an apparent visual luminosity that is 9,000 times greater than the sun. However, the star is relatively cool ranging at 6,500 degrees Fahrenheit—the sun is about 11,000 degrees F —and this low temperature gives it a reddish-hue. This giant star is more than 600 light-years away from our solar system. A light-year is the distance light travels in one year, or about 6 trillion miles (10 trillion kilometers). The globular cluster near Antares is the Messier 4 or NGC 6121. To skywatchers, M4 often looks like a fuzzy ball or dots when seen through a telescope. However, this structure has more than 100,000 stars within it and lies approximately 7,200 light-years away.